Although I cannot call myself a poet, I love poetry. I also love to share my passion for poetry with kids. One of the most exciting wonders of the world is to see that light in a child's eyes when he suddenly gets it, when he understands what a poet is trying to do, and realises he can play with words too. 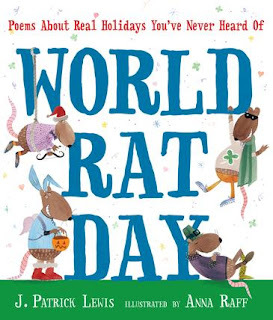 So I was excited to find World Rat Day - Poems About Real Holidays You've Never Heard Of, written by J. Patrick Lewis, illustrated by Anna Raff and published by Candlewick/Walker Books (2013). As well as being the former US Poet Laureate, Lewis is a poet who understands kids. Inside World Rat Day are great groaner gags in the form of word play - Ohio Sheep Day: No one will ever forget Ewe. His poems are perfectly pitched at primary/elementary school level, and all reach out to kids and invite them to join in the fun. There's a mix of short and long, simple and complicated, with some poems very direct, and some showcasing lovely imagery - bats are murmurs to moonbeams and whispers on wings. Raff has contributed so much gorgeous visual detail to the book! I love her quirky cartoon style that gives kids lots to notice, think about and giggle over. In fact, thanks to Raff, World Rat Day makes a great picture book for pre-readers simply to pore over and discuss the illustrations. Understandably, the book is based around special days that resonate with a US audience. That means some sections will need research and explanation for audiences elsewhere e.g. June 2 is Yell "Fudge!" at the Cobras in North America Day with an accompanying poem about making cobras budge by throwing fudge at them. I'm guessing football? But most of the days are universal e.g. December 16 is Chocolate Covered Anything Day. What a cause for celebration! Another reason I value World Rat Day is that it's perfect for librarians who enjoy promoting literacy through themes in their libraries. You may have noticed that I'm keen on this concept myself from my posts like Let's Celebrate Star Wars Day, Cow Appreciation Day, and all the rest of the articles under the Celebrating button in my right sidebar here at The Book Chook. Parents too will enjoy having a children's picture book they can dip into to share the fun of poetry with their kids.